Smart homes are a really neat idea, but is automating your home worth the time and money? These days, automating your home is easier than ever -- and if you have a little extra time and surplus income -- then the answer is yes. Long forecasted to be the wave of the future, advancements in wireless technology and the availability of affordable, reliable smart assistants have rendered setting up a smart home practical for everyone--not just the very rich. What’s more, you can do it yourself with the right gadgets and a little direction. A smart home isn’t just about impressing your neighbors and houseguests. They offer some very distinct benefits. One of the biggest positives of a smart home is how it makes your life easier. Annoying little tasks that you’d once have to perform on your own, like shutting the blinds, setting the thermostat, or even turning off the lights can be automated, leaving you free to focus on important matters. Utility bills can seem exorbitant, especially in the cold winter months when the days are short and the temperatures frigid, or in the peak of summer when you have to blast your A/C to the max just to feel comfortable. Devices like smart light bulbs and thermostats are designed to save energy, and as a result--money--on your electric and heating bills. Smart assistants like the Amazon Alexa devices allow you to configure them exactly to your purposes, setting reminders for certain events, turning off lights at your standard bed time and watering your garden when it needs watering. 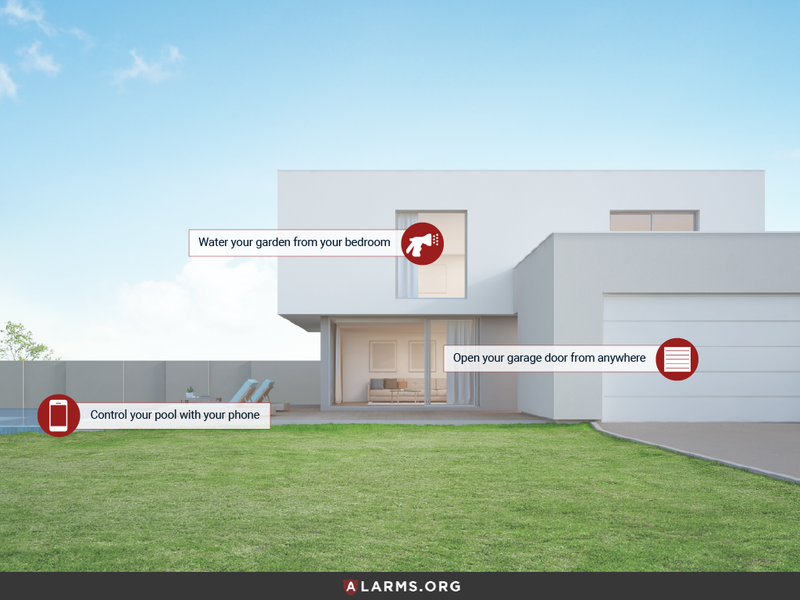 Heightened home security is another bonus of an automated home. Motion sensors and security cameras integrated with your central smart hub make feeling safe cheaper and easier than before. Say goodbye to that nagging feeling you have every time you leave your house that you forgot something --locking the doors, turning off the lights, etc. Setting up a smart home means that all of that is taken care of for you, allowing you to breathe easier when you step out. A smart assistant is essential to a smart home, as many of the additional features and components are run through them. Fortunately, there are many available on the market these days to satisfy a range of preferences and price points. The Amazon Echo is the flagship device running the Amazon Alexa platform. With its advertised 15,000+ skills and affordable $79.99 price tag, it’s also one of the best selling and most versatile smart assistants available. Those looking for an excellent central device to build their smart home around need look no further. At $149.99, the Echo Plus does all the great things an Echo can do, but with the added bonus of a built-in Zigbee smart hub. Zigbee allows you to integrate additional smart-home devices, such as smart locks or dimmable bulbs and you won’t have to hook up an additional smart home hub to do it. A great buy for more ambitious smart home aspirants. While the Echo rests in the living room, or de facto center of the home, one or more hockey puck-shaped Echo dots are great additions for placement in bedrooms, the kitchen and other far flung reaches of the home so you don’t have to yell at the top of your lungs. At $39.99, it’s cheap and shares most of the great features of other Amazon Alexa devices. A flashy new product running the Amazon Alexa platform, the Amazon Echo Show adds a touch screen, providing visuals to go along with Alexa’s speech as well as the ability to make video calls. Not exactly cheap at 150 bucks, the Echo Show is nevertheless the next logical step in smart assistant technology and highlights the ingenuity of Amazon’s design team. For Google purists, or just those weary of Alexa’s voice, the tech and search engine powerhouse offers its competing smart assistant, the $99 Google Home. Many reviews state that the Home is more personable when you speak to it, with a “follow up” mode that doesn’t require you to say “hey, Google” every single sentence you direct at it. It also intuits what you may say next and remembers personal information that you tell it, like the name of your favorite animal. The drawback is that it is not compatible with nearly as many smart devices as Amazon products, although it is quickly catching up. Apple’s recently released smart speaker contender, the Homepod offers great sound quality for all types of music, Siri, and terrific integration with all of your iOS devices. Yet, its lacking in compatibility with third-party smart home devices relative to its competitors, and not quite able to justify its $349 price tag. Some smart assistants, like the Amazon Echo, need a Zigbee compatible hub (the Echo Plus already works with Zigbee devices) to connect it to certain smart home devices. The Samsung Smartthings and the Wink 2 are both ZigBee compatible ( which is sort of a wi-fi/bluetooth alternative that is ideal for low power devices such as lights and coffee machines and thus important for smart homes), making them worthy additions to your smart home setup. Perhaps this is obvious, but it’s important to state that a smart assistant should sit in a central location where you and your family, or housemates, spend the most time, and where it can hear you and you can hear it back. Don’t put it in a neglected corner somewhere. Echo Dots actually work best when placed on the ceiling, where it will catch voice commands much more easily. You can do at home using a non-grounded outlet coupled with a petite adapter adequate to power the Dot. Everything in its right place: each area of your house necessitates its own smart devices. Let’s go from room-to-room and discuss what belongs where, and how you can implement everything. 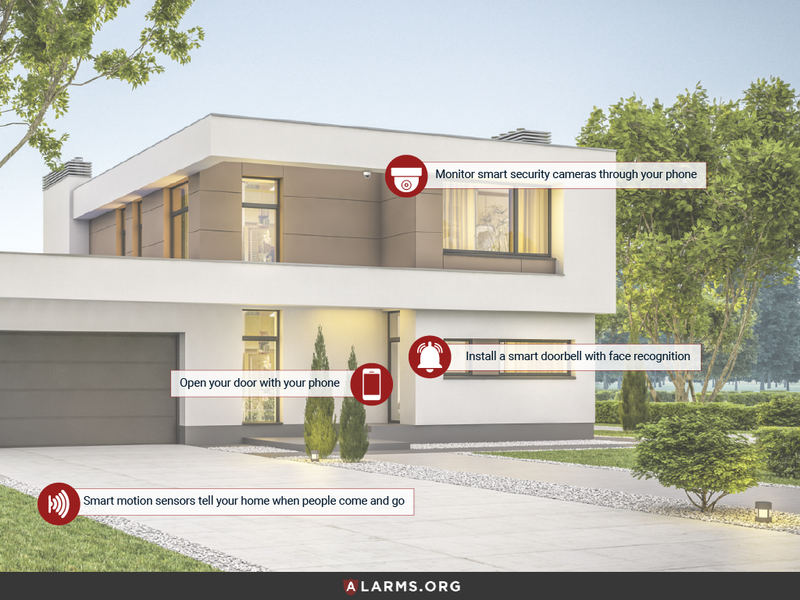 Security systems used to be very expensive, but smart technology puts them in reach of anyone. The Echo Show allows your smart assistant to double as a monitoring screen for security cameras. Two great ones are the Nest Cam Outdoor, and the Logitech Logi Circle (designed for indoor use). Both are small, hardy, and easy to install and integrate with Alexa, which you can do on your phone with the iOS or Android Alexa app. Once they are installed, just ask Alexa to bring up the video feed (provided you have an Echo Show) rendering you a silent witness to whatever is going on in the camera’s realm. The Logi Circle comes with 24-hour backup, will the Nest Cam Outdoor requires the Nest Aware service, starting at $100 a year, to backup footage. We are really in the future, now. When rung, smart doorbells activate a camera to show you who’s at the door on your Amazon Echo Show or Fire TV. The Nest Hello even offers face recognition, so that Alexa can announce who has come calling without the need for you to go look at a screen. Another great option is the Ring Video Doorbell 2, which was designed to work seamlessly with Alexa products. These devices use bluetooth or wifi to send a video to your smart assistant or phone whenever the button is pushed. Most of them are easy as heck to install and compatible with Amazon Echo products and Google Home. Still, you better check to make sure if the smart doorbell you wish to purchase works with your smart assistant. Never worry about forgetting your keys at the office again. Smart locks serve to guarantee that you deadbolt locks and unlocks every time you enter and exact the house. They allow you to open your door using a mobile app on your smartphone, or unlock the door remotely simply by asking Alexa, or Google. If you don’t always want to use your phone to open and close your door, most also come with a touchpad which you can open with a PIN, and a traditional keyhole. Installing them is easy: most don’t necessitate that you replace the original deadbolt on the door and usually just require a screwdriver. The August Smart Lock, compatible with Alexa, Google Home, and most other smart hubs, is one of the best on the market. 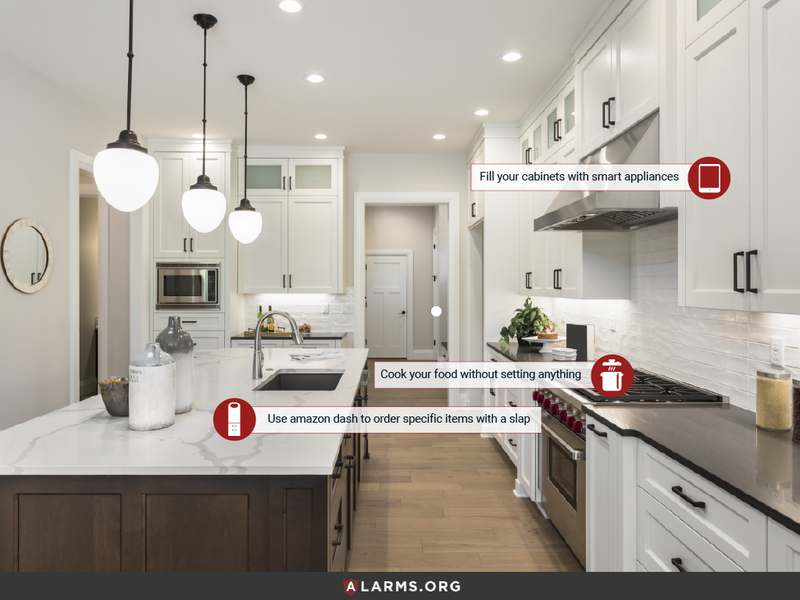 Smart motion sensors do more than you can imagine, and are simple to install and coordinate with your smart assistant. 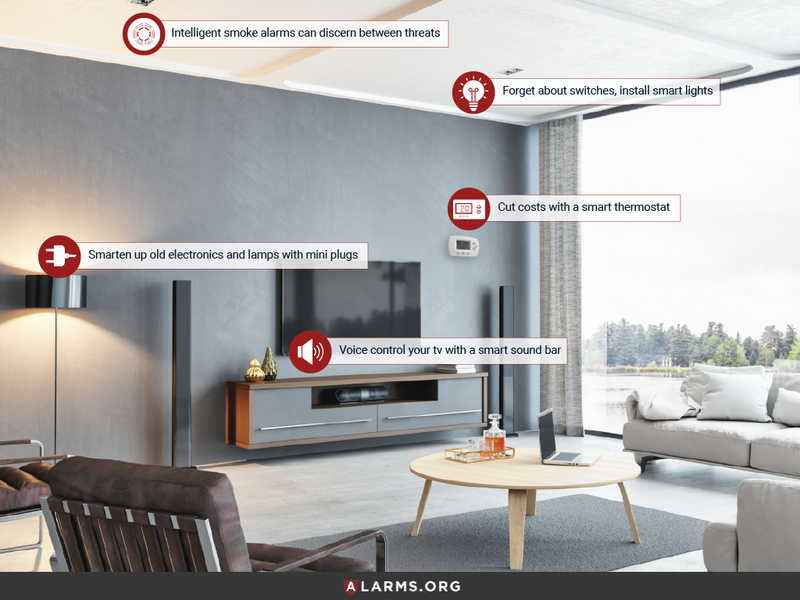 They can detect any movement outside your home in the area that they are installed, switching on a camera, and sending a signal to your Alexa which alerts you to the disturbance. They also just trigger lights to go on when you enter a room, and to go off shortly after you leave it. A cooler aspect is that smart motion sensors like the Samsung SmartThings Motion Sensor can send a signal to your smart thermostat (if you have one hooked up) to switch on the A/C or heater when people enter the room. No need to clap: today’s smart bulbs work with a smart motion sensor (a popular tandem is the Philips Hue Smart Motion Sensor along with Philips Hue Smart Bulbs) allow you to control your lights in ways you never imagined. 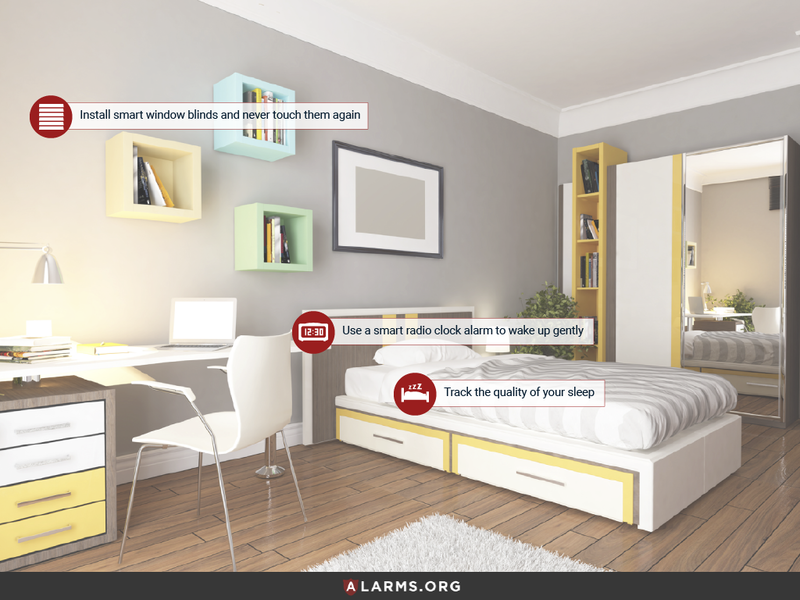 You can set them to turn on and off at designated times, even a week in advance, while the motion sensor detects when people move from room to room. The Philips Hue smart light system is compatible with Alexa, and you can ask her to dim the lights, change the color, whatever you wish. They are also easy to install and compatible with most smart hubs. A must for any up-to-snuff smart home, smart thermostats self-regulate and include proximity sensors that adjust temperatures when people are nearby. They are a great way to save on heating costs without resorting to wearing extra layers in the home. Not only are most compatible with smart hubs, some, like the Ecobee4, actually include a built-in Alexa speaker, rendering it a sort of thermostat and wall-mounted Echo Dot in one. For people that wish to avoid the hassle of setting up a complicated sound system for use with their TV, sound bars are a great alternative: cheap and offering decent sound. Now, they are smart. The Sonos Beam allows you to control what’s on your TV with it’s built-in Alexa, and you don’t need a smart TV to do it. It will also open up apps like Spotify and Audible at your command. Setting up a smart home doesn’t mean that you have to toss all of your old “dumb” electronics and lamps. A cheap $20 dollar mini Smart Socket is a cheap alternative to more expensive smart bulbs and other higher-end smart devices. It works with Alexa or Google Home to switch on-and-off any plugged-in device via a downloadable app, connection to the same wifi network as a your main smart assistant, and a voice command. Just plug that antique lamp into the smart socket and it, too, becomes “smart”. The Onelink Safe & Sound smoke alarm and carbon monoxide detector joins the ranks of ordinary household devices upgraded with a built-in Alexa (or Google Assistant) speaker. Instead of the blanket shrill beep sound for any emergency, the Onelink Safe & Sound gives different alerts based on different hazards, and unlike dumb smoke alarms you can just tell Alexa to shut it off once you get the message. Smart ovens, like the June Intelligent Oven, that sits on your countertop, are scarily cool. The June has a built-in camera that can tell what foods you put inside of it and cook them the proper way. Still, at over $1400, you may have to stick to regular old food cooking machines for the time being. Meat thermometers, slow cookers, trash bins, you name it: everything in the kitchen is getting smart these days. One kitchen-related smart convenience that does make absolute sense is the Amazon Dash. You can slap these little $5 buttons on the wall, connect them to your wifi and slap it whenever you need to and it automatically orders whatever product its designated to from your Amazon account. Smart sleep trackers track the quality of your sleep based on your movement, breathing rate, REM sleep and heart rate through the night. Some you wear on your wrist, while others attach to your bed. Sleep trackers are made for fitness buffs in mind, but regular people can wear them, too. They will give you advice on how to adjust your sleep and are compatible with iOS and/or Android devices. Traditional alarm clocks can be pretty annoying, but the new generation can actually make you feel good about getting out of bed. Smart radio clock alarm is a pretty awesome toy, innovating new ways to get you out of bed in the morning, and require very little effort to install. The Philips Wake-Up Light With Colored Sunrise Simulation does exactly what its name describes: with a combination of light and sunrise-y sounds that begin 20-40 minutes before your wakeup time, the intensity gradually increases with music or natural sounds, rising you up out of bed, gently. It seems like it’s easier to damage blinds than anything else in the house. Worry no longer with the Alexa/Google Assistant compatible MySmartBlinds Automation kit. They can be timed to close and open at sunset and sunrise, or by your command at any time, and even include the option of a rechargeable solar panel. Timed sprinklers are nothing new, but Rachio’s actually adjust their schedule and intensity to account for local weather patterns. They are compatible with smart assistants so you can quietly speak, “Alexa, instruct Rachio to water the yard,” and enjoy the soft symphony of falling water from your bedroom window. Tired of pressing a button to open your garage, like a chump? Well, with the current generation of smart garage door openers--which are mostly smart assistant-compatible and can be controlled remotely with your smartphone--you no longer have to. They won’t break the bank, either, top models like the Chamberlain MyQ only go for $80, plus a $10 annual subscription fee to link your MyQ account to Google Assistant. Most modern pool systems like the Easy Touch Control System by Pentair allow you to regulate your pool temperature and other properties with your smartphone. As a bonus, the aforementioned system is totally compatible with Alexa. Just enable a skill on the Amazon Alexa app. It may seem cruel to tag your child with a tracking device, but gadgets like the AmbyGear Smartwatch, give you peace of mind in knowing where your kids are at all times in a stylish package that they will love. It also has fun apps like a reward system where kids get points for doing household chores, as well as learning games and activities. Just because your child or children are allergic to fur doesn’t mean that they have to be deprived of a loving companion. CHiP is a cybernetic canine that is as intelligent as they come. Like a real dog, CHiP plays fetch, responds to voice calls, and even wakes your kid up in the morning with a loving bark. Use the accompanying bluetooth wristband to give your digital pup positive feedback and treats. The Cinemood is a lightweight mini projector that your kids can take into bed. It comes preloaded with select cartoons and movies, as well as the ability to play media from cloud storage. You don’t have to worry about them watching past their bedtimes since you can turn it off from anywhere in the house through a mobile app. Ordinary pillboxs just sit there, never letting you know whether you or your loved one took their medication or not. If you are advanced in age or suffer from a serious medical condition, missing your medication might mean the difference between life and death. Consider placing a bluetooth-compatible smart pillbox in your bathroom or bedroom to remedy the issue. This one from Tricella that has an alarm to remind you to take your meds and even sends an alert to family members phones if a dose is missed. It may be difficult for some to accept, but investing in an emergency call button that can be plugged into the wall, or worn like a beeper or around the neck can distinguish between falls and normal movement. Such a device can be a lifesaver for an elderly or physically disabled family member. Set them to call 911 and alert your loved ones to a fall or injury. A number of smart devices can make life easier if you or your elderly family member suffers from diabetes or high blood pressure, or any condition that requires frequent monitoring of health conditions. They can send timed updates to the family or the doctor on a regular basis, and emergency alerts if vital readings hit cautionary levels.